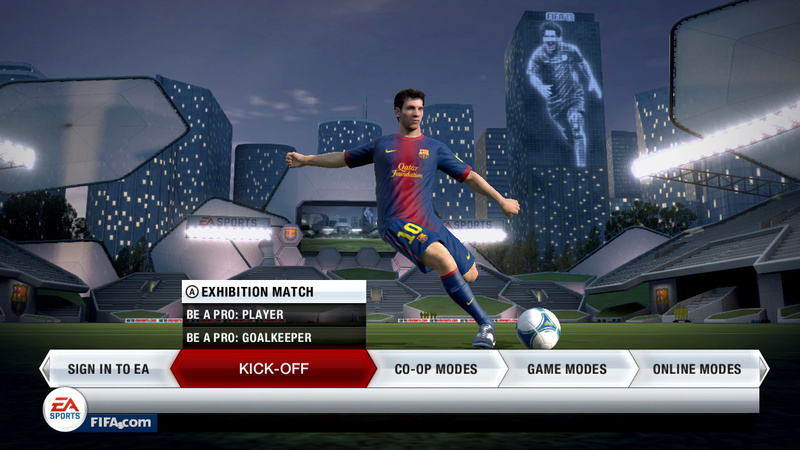 EA has a bit of history when it comes to releasing versions of FIFA on new consoles. No matter how many years the series runs for or how many formats the game is released on, the first edition on a new machine is always a bit hit and miss. You can track that all the way back to the days of the Sega Megadrive and EA’s first console-based FIFA title - FIFA International Soccer – which was in rude health and sitting at the top of the sales charts month in, and month out. The second Sega dropped the Mega-CD onto the shelves, EA released a new full-priced version of the game for it, one that was identical in every way to the cartridge edition – barring the inclusion of an FMV intro and a few extra crowd chants. Their second bite at the cherry generally brings everything back in line, though, and that second version is probably what most die-hard football fans will have to wait for in order to get their fix. The reason being that FIFA 13 for Wii U is a little bit of a strange package. And this makes FIFA 13 a tough game to review. FIFA 12 was a fine game indeed, but knowing how much of an improvement the sequel was, is it still right to score it with a nine or ten as would have happened at this point a year or more ago? It comes down to the age-old argument. Is a £40 copy of Tekken 2 on the PS1 still worth 9 marks out of 10 today, when the similarly-priced Wii U edition of Tekken Tag Tournament 2 blows it out of the water in every possible area? For us, the answer to that is no, as much as we love a bit of retro. Sorry, EA, but it isn't going to happen. We know the difference that the “real” FIFA 13’s new First Touch Control made to the formula, and how much more fun, fast, and fluid that made the match engine feel. We know that your tweaks to the collision engine, animations, general graphics and AI also pushed the game to a whole new level, and set the competing football titles an even higher benchmark to reach for. Being able to manage an international team or get our created player into the World Cup finals gave us something extra to play for, too. Without all of that, you've given Wii U owners a full-priced cut-down edition of the old version of your game, switched in the new teams, players, and soundtrack from the latest version and then stuck that new version’s logo on the box. That really isn't cricket, especially when you were already on a bit of a sticky wicket with Nintendo fans. Back to football, and it would be unfair to say that an attempt at innovation hasn't been made. The new GamePad controls do come in handy when it comes to tacking free kicks and penalties, even if the results do feel a little hit-and-miss at times. When you have managerial control of your side, making substitutions and tactical changes is a breeze with the touchscreen, and you’ll feel a little bit like Gary Neville giving in-depth analysis on Monday Night Football as you change your team’s entire approach in just a few taps. They aren't all winners though, as the facility that allows you to control a player’s attacking run by selecting him and dragging an arrow on the GamePad is next to useless on anything but the easiest difficulty level in single-player games, and completely useless in multiplayer. Generally, by the time you've looked away from the match, found the player you want to move, moved him, and looked back at the action, you will have been tackled. Unfortunately, the player tends to make the run anyway, meaning that he sprints on while everyone else is tracking back to defend after you've turned possession over incredibly cheaply. Touchscreen shooting is also a bit of a damp squib for similar reasons. When you’re in front of goal and you've got defenders closing in on you, it feels alien to go through the rigmarole of shaking the GamePad violently to activate the new shooting mode, and then tapping (and holding) on the screen to aim your shot. It’s worth noting that alternatively, you can press the right stick in to activate the mode, but it still feels overblown and needless when the alternative is to press a button that you already have your thumb on. Again, if you haven’t already been tackled seconds before, your player will have adjusted his footing to avoid an incoming challenge and by the time the shot is taken you end up with a weak daisycutter taken with your striker’s wrong foot, rather than the rasping pearler into the top corner that you were going for. 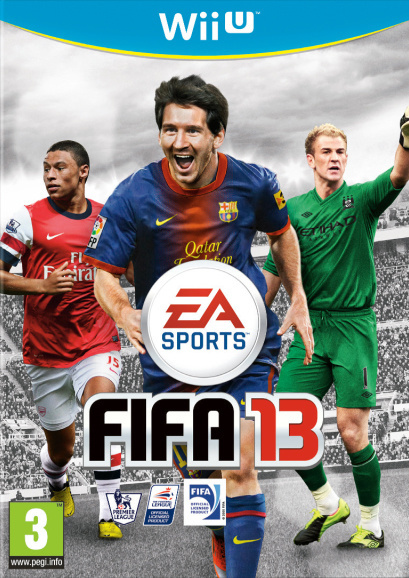 If you've never played FIFA 13 (or FIFA 12) then – gimmicks aside - this edition is still a fine football game. For us, FIFA has been far and away the champion for a number of years, with pixel-perfect passing, great atmosphere, and the ability to control tactical nuances that can truly change the outcome of a match. The Wii U keeps up well with the action visually, although there are occasional slight drops in framerate when the camera pans during a match. A whole host of online modes are missing - most notably Ultimate Team – but offline features such as building up your Virtual Pro or trying to lead your club to victory through the massive Career Mode are still great fun – and addictive. 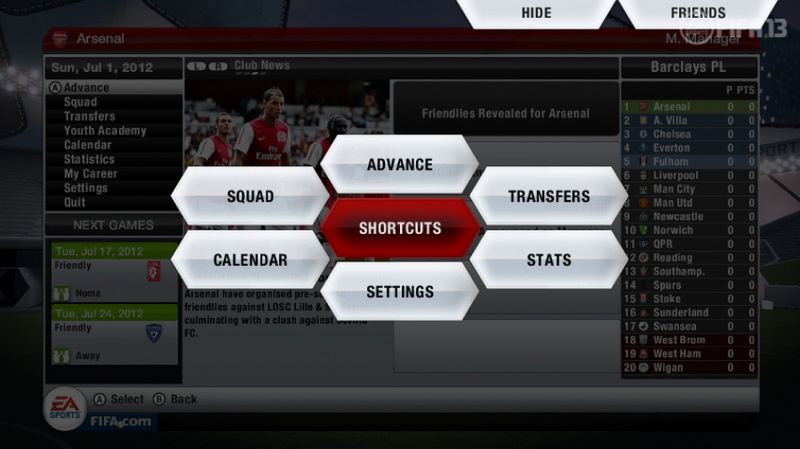 There’s an advantage here to having the old game code in place as compared to the new, too, as you can still be a manager of a team in that Career Mode and include your Virtual Pro in the side – a feature that has been (in our opinion, mistakenly) taken out with the yearly trash on other systems. Local multiplayer fans will be in footballing heaven as well, as if you've got a few friends who all regularly play, the addition of a co-op career where up to four players can play on the pitch at a time whilst one manages the tactics with the GamePad is a great boon, and well done. But even with the on-pitch action being great in 2011's terms, and the off-pitch damage not being too severe, it’s hard to recommend FIFA 13 - simply because we know what it should be like. 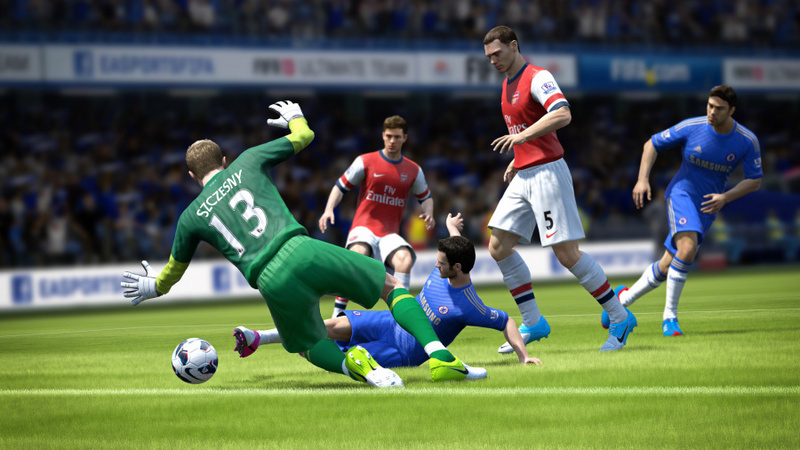 FIFA 13 for Wii U is a fine simulation of the world's favourite sport. In footballing circles, the only game that beats it is its own sequel, which is already out for the Xbox 360 and PlayStation 3, and also happens to be called FIFA 13. The chances are that if you’re really into football games, you've been playing FIFA on one of the other home formats for a while and will have played this edition of the game to death already. If you aren't, then you’ll have no interest in FIFA 13 anyway. That makes us wonder exactly who EA was targeting when it drew up the plans for this one. EA up to their usual sneaky business. My guess is that the target audience is the unsuspecting people wanting the newest FIFA game and just being fooled by the title. What makes little sense to me is why there's a demo for this on the eShop. You'd think they'd want people to buy it before getting the chance to test it out. At least it's better than Madden 13.. I can only guess that the team that made this game had last year's to work with and spent the entire time on the touch controls, rather than the new game modes, I'd imagine the next FIFA will be much better. To be fair the demo was pretty good. The Gamepad features, thou unspectacular, were nicely implemented. May get it as I've only briefly played FIFA on handheld consoles with my oldest son. And this... Is why everyone from the interwebs hate EA. It's too bad they put out a good game once in a while. Fifa 14 it is then. I don't get this. 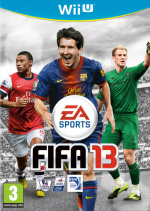 Why not release the other FIFA 2013? @ueI its abit unfair to say that really as its more of a hybrid of this seasons and last seasons fifa. i wouldnt say its a complete port of fifa 12 but it is missing some of the gameplay elements from 13. its weird but it works strangly enough. wow. im surprised u gave it a 6 out of 10. ea is really screwing the nintendo crowd when it comes to fifa games. they just want us to buy up anything that they push out at us. the same game, the same experience thats on the other two platforms. well im sure it will still sell a lot of units on the wii u. but im hoping that konami brings a better football game to the wii u hopefully next year. i won't be giving ea any of my money anytime soon. I'm surprised EA can get away with repackaging the same soccer game all over again but on the other hand I have to admire their balls pulling a stunt like this. Great honest review. does anyone know if konami are bring pes to the wii u? And does anyone rember the virtua soccer series? Disgraceful EA. Its bad enough that most of your sports games are very similar with a few updated graphics, but now you are releasing the same game as last year, not just one, but TWICE, with this along with the whole Wii version clone? It's still a fantastic title, great graphics, and it has few innovations courtesy of the gamepad. All in all, I'm happy with the purchase, even though I already had it for ps3. @3Dash This game is extremely popular, especially in countries where soccer is popular. @Treverend That's OK, the rest of the world doesn't "get" the appeal of American Football either. I mean why is it called football when they use their hands for crying out loud. @3Dash Because it's extremely fun. 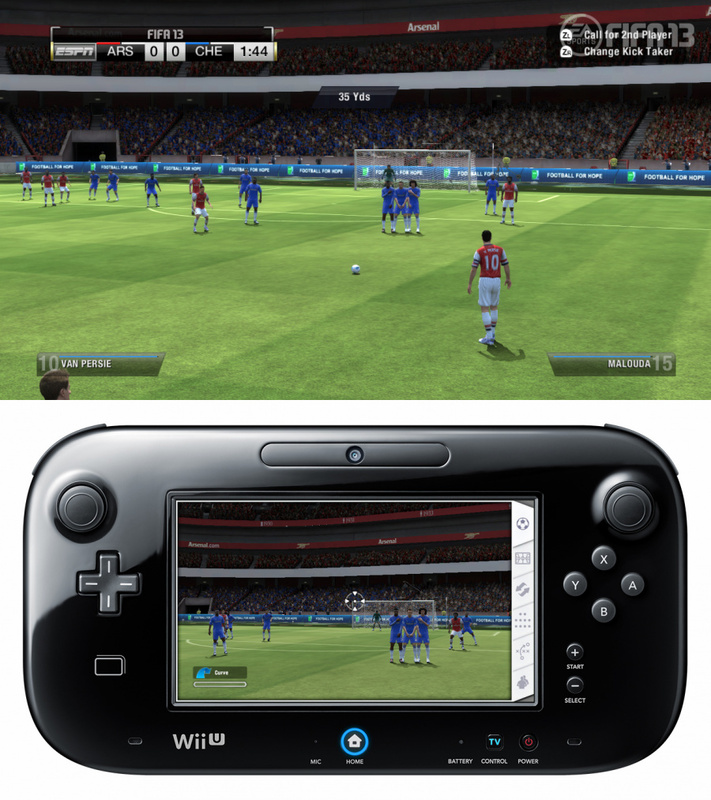 FIFA 13 on the Wii U has the similar solid gameplay experience of its peers, and is the great first shot at HD soccer on a Nintendo console. It hits the essentials and nothing more. Well I have to say since I haven't owned a FIFA game since FIFA 2010 (Yeah I am not one of those people that have to by a new sports game every year just for an updated roster) I decide to pick this one up for the Wii U and I have to say I am impressed. Yeah it might be the Xbox/PS3 FIFA 12 repackaged but for someone who hasn't played a FIFA game since FIFA 10 that doesnt matter. I especially love the off TV play feature that this game has so my son can play FIFA while I am watching TV or even playing something else on the Xbox. Probably will be a few years till I buy another FIFA game now. Tried the demo,and I've become quite addicted to it. Reconsidering getting this game. I only need one soccer game every 4 or 5 years anyway. Now we know there want be a new one from EA or any PES game either. So it's either this or hold out for a watered down soccer game like Real Soccer to come to the Wii U. 10$ at walmart... i buy it, fifa is always the same. Great entertainment.